Have you been seriously injured in a motor vehicle or boating accident, or do you have a personal injury because of another type of serious accident? Do you believe it is because of someone else's carelessness? Are you confused or worried about legal representation? You should hire an experienced Santa Clara personal injury attorney who cares about your rights. At the Law Office of John J. Garvey, III, Mr. Garvey puts over 40 years of personal injury litigation experience into representing injured people and their families with professionalism and efficiency. Exclusively practicing in personal injury has allowed Mr. Garvey to become extremely knowledgeable, enabling him to provide quality legal representation. Attorney John J. Garvey, III, has earned an AV rating under Martindale Hubbell's Peer Review Rating process. If you have sustained a serious injury while on the job, been in an auto accident, or suffered due to someone else's negligence, contact Santa Clara personal injury lawyer John J. Garvey, III, to schedule an appointment today. Initial consultations are free so you can hear your options without cost or obligation. Home, hospital, and nursing home visits offered if you cannot travel to us. We offer flexible appointment times and cases taken on a contingency fee basis (no recovery, no fee). 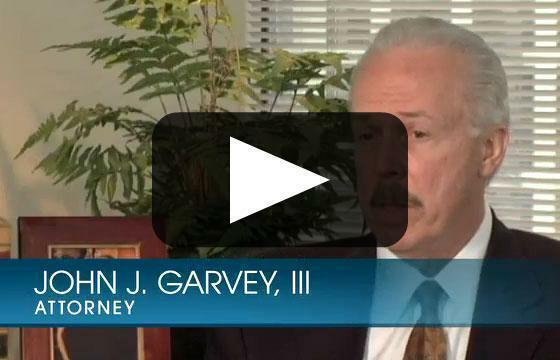 John J. Garvey, III has been practicing personal injury law in California for over 40 years. He has successfully won cases other attorneys would not take. He is highly rated by clients and peers. He gives his clients his complete attention and compassion to their situation and case. At the Law Office of John J. Garvey, III, we strongly believe it is the right of accident victims to obtain monetary compensation from the person or parties responsible for their injuries. For more than 40 years, San Jose car accident lawyer John J. Garvey, III, has represented clients involved in vehicle accidents, including car accidents, truck accidents, bicycle and pedestrian accidents, and injury cases involving mass transit such as light rail and buses. At the Law Office of John J. Garvey, III, our motto is,Justice first. Integrity always. We seek monetary compensation on behalf of people who have been injured due to others negligence. Our law practice is founded on ethical principles and our strong reputation has been developed by way of integrity in all our dealings with our clients, with eyewitnesses, with our legal opponents and in courts of law. When a property owner, property manager or occupier of a property fails to exercise reasonable care to protect the safety of visitors to the property, that person or entity may be held legally responsible to compensate injured people for injuries that occurred. An experienced premises liability attorney can help you identify if you have a claim and provide knowledgeable advice regarding your options. At the Law Office of John J. Garvey, III, Justice first, integrity always is our motto. We welcome requests for free, honest initial consultations from accident victims and their families. Call 408-293-7777 to schedule a preliminary case evaluation with a personal injury lawyer--whether you were the truck driver, an occupant of another motor vehicle or a family member of a pedestrian who was killed by a truck. Not all work-related accidents are due to unsafe workplaces. If you drive for your employer and are the victim of a motor vehicle accident, you may have a claim for your injuries. If during your employment a defective product injures you, you may have a claim as well. Not all work-related injuries are the same. If you have been injured on the job, and believe a third party someone or some entity outside of the employer-employee relationship caused or contributed to your accident and your injuries, you need an experienced attorney to make sure you are properly informed and that your rights are asserted. The trucking industrys primary regulator, the Federal Motor Carrier Safety Administration (FMCSA), has proposed Comprehensive Safety Analysis 2010, a new measurement, enforcement and compliance program designed to measure drivers safety habits and training.